Flavonoids are water-soluble polyphenolic molecules that have 15 carbon atoms. They appear as two benzene rings that are connected together by a three-carbon chain. One of the carbons of the chain is always joined to a carbon of one of the benzene rings, either directly or through an oxygen bridge, resulting to the formation of a third middle ring, which can be five- or six-membered. Flavonoids are composed of six major subgroups: chalcone, flavone, flavonol, flavanone, anthocyanins, and isoflavanoids. The most important flavonoids include lutein/zeaxanthin, cryptoxanthin, quercetin, capsanthin, anthocyanins, hesperidin, catechins, rutin, beta-carotene, alpha-carotene, lycopene, and resveratrol. 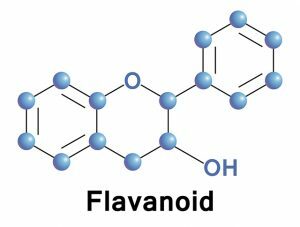 The word “flavonoid” takes its name after the Latin term flavus, which means yellow. Saying so, flavonoids provide the color yellow to some plants. Other flavonoids provide the red color of buds, leaves, or shoots during the fall. Flavonoids are also responsible for the color of many fruits. Flavonoids help out plants in some other ways. Sometimes, they help plants make themselves attractive to catch prey. The sundew uses anthocyanins in their flowers to attract insects which it then eats. The flavonoids in plants also protect them against intense ultraviolet radiation. Since flavonoids are only found in plants, we must make it a habit to eat green leafy vegetables. Flavonoids have antioxidant, anti-allergic, anti-cancer, anti-inflammatory, and antiviral properties. For instance, the flavonoid quercetin has been known to stave off the symptoms of asthma, hay fever, and sinusitis. Flavonoids are good for the skin. They can relieve the rashes brought about by eczema. Flavonoids have cancer-fighting elements that can help block and inhibit the growth of carcinogenic cells. Flavonoids are good for preventing diabetes. They lower cholesterol and triglyceride levels in the body. Flavonoids are good for the cardiovascular system. They hinder the oxidation of low-density lipoprotein (LDL) cholesterol, which is a good step towards lowering the risk of incurring atherosclerosis. It has a tonic effect on the heart and optimizes the cardiovascular system by strengthening the heart muscle and improving blood circulation. The credit goes to the flavonoids quercetin, genistein, and luteolin. They nourish the capillaries and prevent them from breakage. They also aid in the blood clot formation in the vessels, allowing for better circulation. Flavonoids are good for the female reproductive system. They can help women ease the pain of menstrual cramps, especially soy flavonoids. Flavonoids are good for the excretory system. The flavonoid silymarin from milk thistle has been proven effective in protecting the liver from hepatitis. Flavonoids are good for preventing diabetes. Flavonoids are good for the cardiovascular, excretory, and the female reproductive systems. Flavonoids have antioxidant, anti-allergic, anti-cancer, anti-inflammatory, and antiviral properties.